There is something particularly special in listening to children pray, and in praying with them. This was brought home afresh to me today when I read Children’s Letters to God, compiled by Stuart Hample and Eric Marshall. While some of the prayers included in this volume seem not merely humorous but silly (to an adult), most betray a deeper cognition. All betray, however, a glaringly beautiful honesty and unpretentiousness that God not only makes possible for us, but encourages in us by the Spirit. Dear God. Are you really invisible or is that just a trick? Dear God. Did you mean for the giraffe to look like that or was it an accident? Dear God. Instead of letting people die and having to make new ones why don’t you just keep the ones you got now? Dear God. Who draws the lines around the countries? Dear God. I went to this wedding and they kissed right in church. Is that OK? Dear God. Are there any patriarchs around today? Dear God. It’s OK that you made different religions but don’t you get mixed up sometimes? Dear God. I would like to know why all the things you said are in red? Dear God. Is Reverend Coe a friend of yours, or do you just know him through business? Dear God. I am English. What are you? Dear God. Thank you for the baby brother but what I prayed for was a puppy. Dear God. How come you didn’t invent any new animals lately? We still have just all the old ones. Dear God. Please put another holiday in between Christmas and Easter. There is nothing good in there now. Dear God. Please send Dennis Clark to a different camp this year. Dear God. I wish that there wasn’t no such thing of (sin. I wish that there was not no such thing of war. Dear God. Maybe Cain and Abel would not kill each other so much if they had their own rooms. It works with my brother. Dear God. I bet it is very hard for you to love everybody in the whole world. There are only 4 people in our family and I can never do it. Dear God. If you watch in Church on Sunday I will show you my new shoes. Dear God. I am doing the best I can. 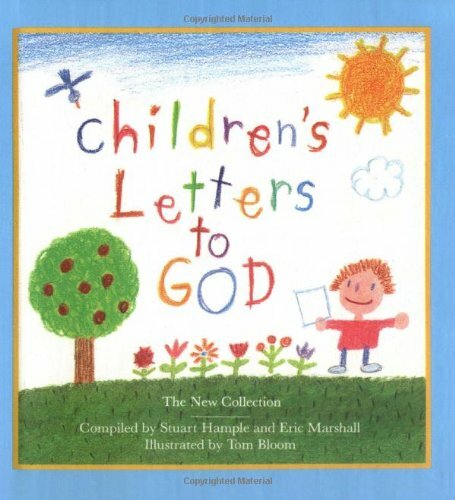 Children’s Letters to God is a great little book to use to open up the questions of life, of God, and of the world – and to encourage mutual and humble dialogue which, after all, is at least part of what we are engaging in when we pray. Warmly recommended … as is prayer. Thanks for sharing & for the reminder on the last one. What a truly powerful prayer indeed!